Anybody else on these boards work at the old GPO delivery office in Queen Victoria Road. Closed 1976 when it was moved to Bishop Street. 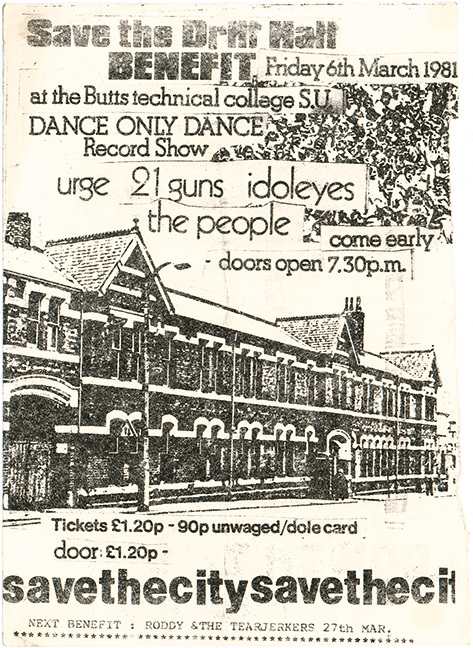 I remember the Drill Hall being used for 'Ideal Home' type exhibitions around 1950 (give or take a bit). For those members who have yet to venture over to the map scans on the Main HC site, an aerial view from the mid 1960s can be found HERE. The drill hall is in the bottom right hand corner of the scan. Thanks Tony-there are some interesting things to look at-but I haven't spotted Wally yet! On 25th Oct 2012 11:46am, heritage said: I remember the Drill Hall being used for 'Ideal Home' type exhibitions around 1950 (give or take a bit). Hi Heritage, I've always had the idea in my mind that the Drill Hall was used for 'Ideal Home' type exhibitions, thank you for clarifying it. Sometimes things get a bit muddled as you get older. Tricia - I think you are right. There was a period when the Drill Hall was used for all sorts of events, including boxing, wrestling and dancing. I remember counting votes there after one election. There were also two parts to the building and I am think that the smaller part of it was used by the Dunlop. Hi Mick, I remember the Drill Hall being used for counting votes after elections. My father used to take me to see the wrestling at the Drill Hall on some Saurday nights. I would probably be about 10 at the time and always used to enjoy it. I wouldn't cross the road to watch wrestling now! All this is a revelation to me, never having heard of the Drill Hall! Just another historic and iconic building which our Council wanted rid of so that they could pursue their god of `progress`. I put a 1960`s picture on another forum, this week, of two massive houses (one of which was a `pair` to one still existing in Little Park Street) which were an important part of the city`s history and was amazed to be told that they had both been destroyed. They were in Priory Row near Hilltop. I believe that they were built by three brothers, competing to build the 'best' house. Did this end up as a car park for years? Looks like a perfectly decent building. The damage inflicted on Coventry in the post war years continues to astound me. Everyone thinks the wartime damage was responsible for the somewhat low quality city centre, but it's clearly not the case. Even in my short time here there's been needless destruction and poor quality new buildings or just empty spaces. It's almost heartbreaking to see all this stuff needlessly demolished - whether it's the fine office block for Alvis or the city centre's surviving old streets, bustling with commerce and people... Just five seconds in a dismal place like 'Ikea Plaza' and it's pretty clear that some huge mistakes have been made, and continue to be made. It's not coming back now, though. Agreed Flap. I was not just the war and tbh the demolition mistakes started before then (think Little Butcher Row). On demolition it did become this car park. Terrible waste. I know 'generalzorn' who took that photo! When was it demolished? When I came to Cov in 1989 people were complaining that it had been knocked down or was going to be knocked down. People were also grumbling about the destruction of the old library building. But I think there are bigger problems locally these days than buildings.